Have you ever wanted to go to Cabo for free? Well, thanks to the countless promotions and sweepstakes hosted by hotels, resorts, airlines, etc there is often a good chance you might be able to snag a free vacation to Cabo. Marivic, our social media guru, scans the web for promotions and sweepstakes that can land you a free trip or at least some free activities or a hotel stay. We try to keep this list of Cabo sweepstakes as up to date as possible, so please let us know if you know of a sweepstakes or giveaway that should be added. But we understand if you don’t want to share and keep the odds in your favor. Be sure to follow us on Facebook and Twitter for more ways to win. Pueblo Bonito is celebrating their 25th Anniversary by giving away a trip to Cabo. Complementary shuttle to Pueblo Bonito sister resorts where you can enjoy all inclusive dining. We are still gathering more free stuff in Cabo. Hopefully, we will have a lot of tips for you soon. 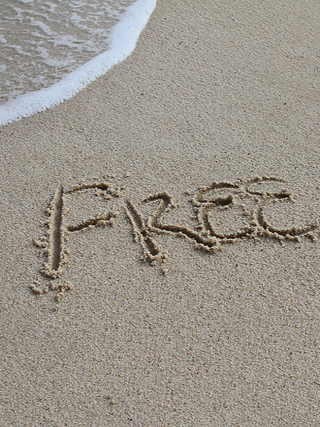 If you know any great offers for free stuff in Cabo, shoot us an email. Can’t wait to hear from you! 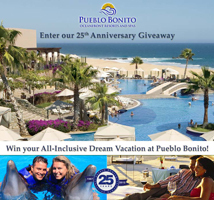 In celebration of their 25th Anniversary, Pueblo Bonito Resorts is giving away at 7 night all inclusive stay at one of their resorts plus many additional prizes. Check their Facebook for more details about how to enter. Sign up for Pueblo Bonito Resorts’ newsletter and be entered to win a 3-night stay in a Junior Suite at Pueblo Bonito Sunset Beach in Cabo San Lucas or Pueblo Bonito Emerald Bay in Mazatlan. Reservations are subject to availability.